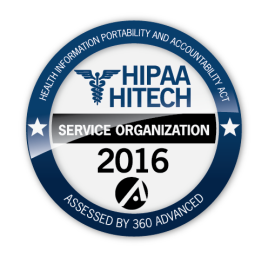 WARREN, N.J.—(9/19/16)— AdvantEdge Healthcare Solutions (AdvantEdge) today announced successful third party recertification for HIPAA and HITECH privacy and security requirements by 360 Advanced. For the fourth year running, the audit results demonstrate AdvantEdge’s total organizational commitment to meet the rigorous data and security requirements of HIPAA and the HITECH Act. “This recertification demonstrates that our standards for revenue cycle management services for physician practices, hospitals, ambulatory surgery centers, and behavioral health agencies are “above and beyond” those of most firms in the industry. Healthcare providers can have a higher degree of confidence in AdvantEdge’s rigorous standards for security and privacy,” said David Langsam, President & CEO. “The AdvantEdge Healthcare Solutions approach to compliance management ensures the highest level of HIPAA and HITECH compliance standards, while, at the same time our enabling daily operations to achieve the highest possible performance for our clients,” said Mr. Langsam. AdvantEdge is a technology-enabled provider of healthcare business management solutions and business intelligence tools that substantially improve decision-making, maximize financial performance, streamline operations, and eliminate compliance risks for healthcare providers. AdvantEdge continues to gain meaningful scale through organic growth and strategic acquisitions, having completed seven since 2007. AdvantEdge is recognized as one of the top 10 billing, coding, and practice management companies in the U.S.; has more than 600 employees in eight regional offices in the U.S. and one office in Bangalore, India; and collects approximately $1 billion annually for its physician and hospital clients using its proven technology. AdvantEdge clients include hospital-based physicians, hospitals, ambulatory surgery centers, behavioral health agencies and large office-based groups. AdvantEdge is backed by major investors Safeguard Scientifics (NYSE:SFE) and Founders Equity. For more information about AdvantEdge, please visit our website at www.ahsrcm.com, follow us on Twitter at @DoctorBilling and on LinkedIn.